Add pure maple sugar to any meal or recipe with this sweet set. For most of us, maple syrup is a rare complement to weekend pancakes or enjoyed as little leaf-shaped candies spied in woodsy shops on summer vacation. But for Dori Ross, maple is part of her Canadian birthright. It was such a common sweetener on her family's rural Ontario table that they referred to it simply as "sugar." 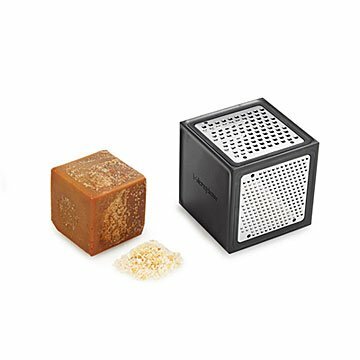 This set of a pure maple sugar cube and grater is a passport to that provincial pleasure. You could follow Dori's lead and grate a little on top of your morning latte, or add some singularly sweet goodness to oatmeal, fruit, or ice cream. To create these distinctive cubes, Dori teamed up with local sugar makers in Vermont's Mad River Valley who supply her with a dark, robust single-source syrup. She also works with a group of local candy artisans who transform the liquid staple into a golden, grateable solid. The set's multi-functional grater provides the perfect place to grate, store, and measure crystals shaved from the block. Together, the cube duo makes a delicious, giftable addition to any table. Maple cube handmade in Vermont. Grater made in China. Maple syrup is part of Dori Ross's Canadian birthright. She grew up on a farm in rural Ontario, where she and her four siblings experimented with tapping trees with their amateur arborist dad. When she moved to Vermont, Dori couldn’t help it—she found herself starting to sugar with her own kids. But instead of continuing to collect sap and selling the syrup, she realized that she wanted to apply her marketing experience to help hardworking maple producers and to elevate the status of their product. So she teamed up with local sugar makers in the Mad River Valley who supply her with single-source syrup, and a group of local candy artisans who transform the liquid staple into solid, unique goodies. Plus, to make sure maple syrup in all its glorious forms is available for future generations, Dori works with the University of Vermont's Proctor Maple Research Center to assist climate change research, local farming efforts, and sustainable forest stewardship. Grater: 3.5" L x 3.5" W x 3.5" H; Maple Cube: 2" L x 2" W x 2" H, 7 oz. Includes microplane grater and 100% pure maple sugar cube.